Dense protein aggregates called inclusion bodies are found in the neurons of those suffering from any of several neurodegenerative disorders including Alzheimer, Parkinson, and Huntington diseases. Some evidence suggests that these bodies are protective, there to sequester proteins that may otherwise harm the cell (see ARF related news story). Other evidence suggests that inclusion bodies are toxic and are, in fact, a sign that a common pathological mechanism underlies these seemingly disparate diseases (see ARF related news story). Which is the correct view? To answer that question one would need to track individual neurons in real time, watching to see if the formation of an inclusion body was a harbinger of death or a giver of life. So far, such an experiment has been technically elusive, but in tomorrow’s Nature, Steven Finkbeiner and colleagues at the University of California in San Francisco and Los Angeles report that they have used a robotic microscope to track hundreds of individual neurons expressing mutant huntingtin, the protein that causes Huntington disease. Their results strongly support the notion that inclusion bodies are neuroprotective. The automated microscope was designed with a robotic stage so that individual neurons could be repositioned under the objective lens, even after the slide had been removed and replaced. First author Montserrat Arrasate and colleagues trained this microscope on striatal neurons infected with gene fragments for various toxic forms of huntingtin. Although all people carry huntingtin in their neurons, in those affected by Huntington disease, a normally small tract of glutamine amino acids in the protein has expanded to 40 or more. The longest tracts lead to the most severe, earliest-onset forms of the disease. The authors tagged these polyglutamine-expanded huntingtins with green fluorescent protein (GFP), allowing them to monitor protein distribution via fluorescent imaging. The images told a compelling story. The authors found that a cell's risk of dying after infection remained fairly constant over time. This suggests that inclusion bodies, which form some days after infection, may not be all that bad. In support of this, the authors found that only about one percent of neurons that form an inclusion body die within the next 24 hours. In addition, when the authors looked at neurons that did not form inclusion bodies, they found that the risk of death was greater in those neurons with the longer glutamine tracts. That the length-equals-toxicity relationship holds true in cells devoid of inclusions suggests that it is the diffuse huntingtin that is most toxic. In support of this, Arrasate and colleagues found that the level of diffuse huntingtin in the cell was the best indicator of how soon the cell would die. 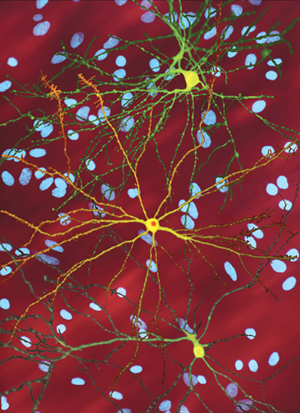 But the icing on the cake came when the authors examined neurons as they formed inclusions. Images show that when an inclusion forms, almost all of the diffuse huntingtin gets incorporated, leaving the cell practically huntingtin-free (see figure). So could inclusions actually be protective? Apparently so. The authors found that though cells that survived for four days or more had started with similar, and relatively low, levels of diffuse huntingtin, their future survival depended on the formation of inclusions. Those that sprouted inclusions on day four had twice the chance of surviving as adjacent neurons without inclusions (on day six, risk of death was almost 100 percent for neurons without, and only about 40 percent for neurons with, an inclusion body). In addition, where the inclusion body formed didn’t seem to matter; those forming in the cytoplasm and nucleus were similarly protective. Arrasate M, Mitra S, Schweitzer ES, Segal MR, Finkbeiner S. Inclusion body formation reduces levels of mutant huntingtin and the risk of neuronal death. Nature. 2004 Oct 14;431(7010):805-10. PubMed. Orr HT. Neurodegenerative disease: neuron protection agency. Nature. 2004 Oct 14;431(7010):747-8. PubMed.